On the busiest day in the history of Grand Teton National Park, with the moon beginning to eat away at the outline of the sun, I stood across from one of America’s great swaths of imposing beauty — what else do you call monstrous, jagged snow caps that rise up out of otherwise peaceful, rolling plains? — and felt strangely calm. My friends sat nearby, snacking and talking s**t. A group of women next to us from Bozeman, Montana discussed the amount of time they let their kombucha ferment. All together, we formed a “crowd” of seven people. I buttoned up my flannel and lay back, waiting. It was 10:30 a.m.
Part of preparing for the worst-case scenario is in my nature: If there’s ambiguity, I’m stressed. But part of it, in fairness to me, was due to the build-up of the prior few weeks, as news reports and blog posts and conversations with National Park rangers delivered many warnings about what it might be like in western Wyoming come Eclipse Day. “Expect to live for weeks in your car, peeing directly into your own mouth,” the National Park Service site… didn’t say. But that was the vibe. They did say to expect gridlock and delays, as well as the need to supply your own food and water. Newspapers (ha, okay, sorry — news websites) predicted miles and miles of cars on the highways, as tourists from all over made their way into the mountains via major hubs like Denver and Salt Lake City. And afterwards, when everyone tries to leave at once? Forget it. That all made sense. The path of totality was a band about 70 miles wide, and if enough people tried to stuff themselves into that band, that would be a problem. The Great American Eclipse website described said to expect “an onslaught” of eclipse tourists, as if Mom, Dad, and The Kids would come wielding broadswords and shields. And yet, here I was. I wasn’t in the park itself, but literally across the street: Bridger-Teton National Forest is nearly contiguous with the park and offers stunning views of the entire Teton range, with rolling green hills in every other direction. From where I stood, I had no doubt that I could throw a football over them mountains. To top it off, by not entering the park, my group and I avoided even the semblance of crush — no traffic, no frantic scramble, no jostling for position and/or kicking children and the elderly. 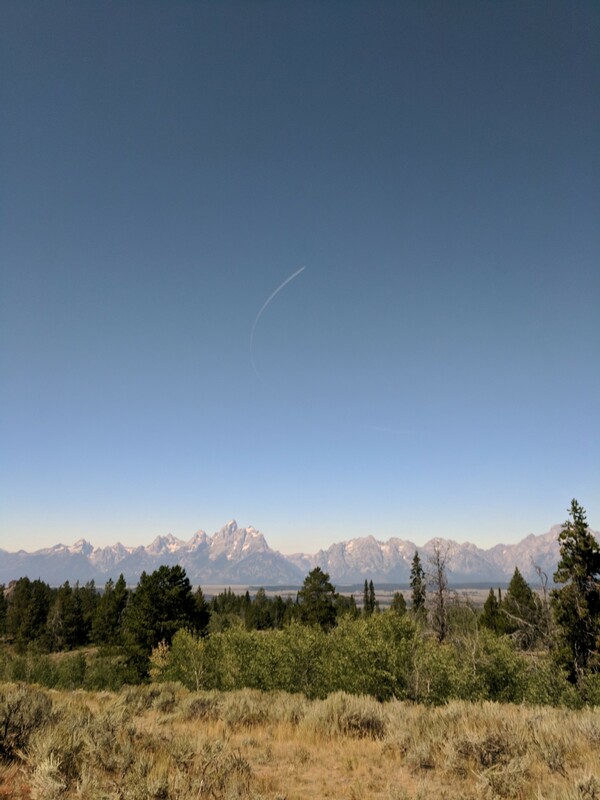 We took a leisurely stroll to the top of one hill, and then another, before choosing a bluff overlooking “The Observatory” (a well-documented “dispersed campground” in the forest that affords fantastic stargazing as well as mountain views) with the Tetons to our backs and the sun high overhead. Then we settled in to have our minds blown. But don’t get it twisted: We worked for our spot on that bluff. As far as I’m concerned, our months of planning paid off, and beautifully. My friends and I, four guys from Brooklyn (though two of us have escaped in acts of self-preservation), flew into Denver International Airport — one of the nicest and oddest airports I’ve ever visited, thanks to its eclectic art collection and Nazi conspiracy theories — on Friday, August 18, and spent the day shopping in advance of a total of six days of camping. Our plan was to camp in Sinks Canyon State Park, in Wyoming, on night one, find a dispersed camp site in Bridger-Teton or Shoshone National Forests or Gros Ventre Wilderness on night two, then camp in a Yellowstone the night following the eclipse before heading into the Yellowstone backcountry for three days. I compiled a list of possible “dispersed camping” sites in Bridger-Teton and Shoshone and Gros Ventre — all the possible campsites within Grand Teton had been filled up for months by the time I inquired. Dispersed camping is camping in national forests, grasslands, and other non-parkland around the country. You just find an area, set up camp, and sleep there. Usually people tend to visit the same general areas to do this, so there’s something of a community around you and resources aren’t too far off — but no amenities await you. It’s just your tent, your gear, and in this case, your car. Sites like Campendium give you reviews, descriptions, and coordinates of popular dispersed camping sites. We figured we’d get to the area early enough on Sunday to move around between our options, in case some were so full that we wouldn’t fit. Driving north on I-25 on Saturday, we braced ourselves for a crush of traffic that would strand us just outside of Denver. Even then, we were unsure of how crowded things would be. Small waves of farmland spread out to our right; to the left, grasslands gave way to the mountains in the distance. Wagon wheels populated the fields, and just off the highway lay dirt roads that wound past ponds and the homes beyond. We passed a picturesque cabin sitting alongside the train tracks running next to us, like a moment out of time. A few minutes later, we passed a Costco and a place selling steakburgers and frozen custard. There is no escape from the endless mall that is America. We did find ourselves stuck in a few minutes of traffic, but Waze helped us navigate around the small jam and back onto I-25, where the road opened up. Skinny horses and dark cows stood in scrubby grassland as we approached the Wyoming border. The sky was big and blue, and the ground began to flatten out. Bales of hay sat next to the road. This part of the world was starting to look like what I thought it would look like. As if on cue, small jagged rocky bluffs appeared, bursting out of the grass; a smattering of “buffalo” (more on that in a second) appeared next to a store selling fireworks; wind farms loomed in the distance, the mills creating motion where all else was still. We headed onto I-80, briefly slowing down to inspect a line of train cars covered in graffiti, stretching for a mile. It felt like a wall. For a moment, I felt fine with the concept of building a gigantic wall across our southern border, provided it was could be decorated with dope tags. More miles of containers on the train tracks flanked us as we shot west, green and blue and orange rectangles. We passed a monument to Abraham Lincoln, learned from a rest stop exhibit that the animals we had always called (and would continue to call, out of habit) “buffalo” should be referred to as “bison,” and paused at a gas station to buy knives. We passed through the overgrown McDonalds that is Rawlins, Wyoming and headed north on Route 287. At first the stretch seemed uninspired, a two-lane highway surrounded by mostly flat gray-green plains. Then the view opened up and the mountains appeared: A white band of sheer cliffs belting the range to our right, a red scoop of rock on the left. The sky got wide and pale as we sped down the road in a neat straight line, feeling as though we were crawling as we watched the mountains grow bigger, become immense, then recede over the next hour. We blew through the blown-out towns of Muddy Gap and Jeffrey City, husks of commerce in the harsh windswept plains. We decided to never run out of gas there. During a brief stop to change drivers and pee by the side of the road, things were so quiet that approaching cars sounded like airplanes overhead. We got pulled over for speeding. I was not driving. We’d had conversations about not wanting to interact with Wyoming cops in our Colorado-plated car. I sat in the backseat, steaming, as the cop approached. “Where are you going?” the cop asked, or something like that. We told him: Sinks Canyon before heading to Grand Teton National Park for the eclipse. He said he’d be right back and went to his car. The others cracked jokes while I stared out the window and thought annoyed thoughts. The cop came back to the window. “You f**kin’ Jews are going to jail for not voting Trump,” he said, cocking a shotgun. Just kidding. He returned a few minutes later with a warning and four pairs of eclipse glasses, turning this into the single greatest interaction I’ve ever had with law enforcement. We declined his offer, since we had our own already, but thanked him effusively. I considered getting out of the car and kissing him, but decided to play it cool. Sinks Canyon State Park, sun-blasted and drained of color when we arrived in the early evening, gave us what we thought we’d need to expect over the next few days. After climbing up to the top of the canyon via a series of dizzying switchbacks (in our car — so far our physical activity had been limited to getting in and out of the vehicle and walking through a variety of big box stores to find last-minute supplies), we journeyed down a rocky, pitted dirt road, scraping the bottom of our rental car, until we reached Frye Lake. Campers and tents covered every available spot near the shore. We had long ago passed any official campgrounds — which were full, and had been reserved for some time — and were about to try dispersed camping for the first time. But we had to push further on down the service road, leaving the water behind, as most flat, cleared land had already been claimed. Sinks Canyon lay just outside the path of totality, so many campers had arrived early and put themselves in position to travel a short distance to see the eclipse. This was just a pit stop for us. Luckily, we found a small patch of land next to a bend in the road that served us just fine. We set up camp, cooked our first meal, made our first fire, and drank rye under the dusty Milky Way. Eventually, we went to sleep — except for me. I began a tradition that would last me through the duration of the trip: spending the night huddling deeper and deeper into a smaller and smaller ball of a person, trying to survive despite using a sleeping bag not properly rated for nights at these temperatures (which routinely dropped below freezing). I “woke up” every morning with sore abs, having worked them out the night before by shivering so violently. We left Sinks Canyon before the sun cleared the lip of the canyon wall and had breakfast in Lander, a nearby town similar to the other Wyoming towns we’d pass throughout our trip: Pleasant, with a wide main thoroughfare flanked by rundown storefronts and trendy coffee shops alike. We ate breakfast burritos and oatmeal in one of those shops, which at first seemed to be yet another hipster outpost, due to the climbing wall inside and the general vibe. But upon further inspection, in a surprising twist, the place was staffed by Catholics, not hipsters. Young Catholics in Lander, Wyoming dress like hipsters, and style their hair like hipsters, and love putting coffee in awkward shallow-and-wide mugs like hipsters, but are actually just super religious? I’m guessing — I didn’t ask how religious they were, I just saw that they sold Wyoming Catholic College merch and that the college apparently made all the food for sale. Stepping out into the cool morning air on our way back to the car, I felt invigorated. For months, Lander had just been a point on the map. A very convenient point: It was right outside Sinks Canyon, seemed relatively big (literally: it appears before other town names do on Google Maps when you start zooming in on the region), a possible place to stop for breakfast or refueling or shopping (we ended up buying a second canister of bear spray at an outdoor supply shop there, so that checked out). It was surreal to finally be on that point on the map, walking the streets, sitting among the residents, breathing the air that to that point had only been theoretical. I had a thousand images of Lander in my mind before the trip, and like my images of every other place we’d visit or that I’d ever visit, none were remotely correct. Not because Lander is some wild, exotic locale; it just is what it is. Another place that exists, in which one can exist. That in itself was exciting. We continued our pattern of hitting big box stores (we decided we needed more hand sanitizer, as well as layers of clothing) by stopping at Wal-Mart in Riverton, but otherwise drove unceasingly towards our goal. The landscape shifted from pristine homes to blasted yellow earth to incredible formations of rock — spires of red and white like castles and churches, huge chunks of red rock over Wind River, bands of purple running across stone mounds. Things got greener as we left the Indian reservation area, then passed into national forest land. White towers of stone rose high over the green and purple-black trees. Though we passed camp sites along the road — some populated with tepees — promising premier views for the eclipse, and kept our ear to the local radio for warnings of herds of people or traffic pileups, we hardly passed another car on our way up through Shoshone and then Bridger-Teton. We were coming from the east, and thus wouldn’t pass through Jackson, the “big city” just outside Grand Teton that boasted an airport and thus would probably be a madhouse. It felt like we were sneaking in the back way. Our directions were set to coordinates I’d gotten off the internet, from Wyoming’s “casual encounters” section of Craigslist. Nah, I’d called up the park and asked for suggestions for dispersed camping sites and gotten “The Observatory” as the response. Its coordinates were listed on Campedium. As it turned out, finding it couldn’t be easier: Once the Tetons were in sight, we turned off the highway that served as the park’s eastern boundary and started up a bumpy but passable Forest Service road. After passing countless RVs, tents among the pines, tents in the tall grass along the road, and folks suspended in hammocks, we turned off and came to a wide clearing, ringed by hills, dotted with wildflowers and pine trees. The jagged spine of the Tetons loomed in the near distance. We eventually settled for a site near a few other tents in the clearing. In this area, there were perhaps a dozen other tents. By the evening, that number would climb to a dozen and a half, two dozen at the most. There was plenty of space for all. Golden light splayed over the purple and green of the fields as we made dinner, and just before nightfall the Tetons were back-lit by a deep pink, giving way to blues and then black. Back on that bluff overlooking The Observatory on eclipse day, time had inched forward and it was now 11:09 a.m. The sun felt noticeably less intense; through our cardboard shades we could see that it had been cut in half. A few minutes later, it looked more like a banana. I had a strong urge to eat a banana, but with no bananas in sight, I rode it out until it passed. At 11:25 a.m., it began to feel legitimately cold. The sun was just a sliver. The wind picked up. It had all happened gradually over the last hour — then all at once, the process sped up and the light disappeared from the sky. The Tetons were pink and gold, then we looked back to the sun with our glasses and watched the orange line of sunlight shrink like sand from hourglass, the eclipse becoming total. Then the sunlight was gone. I ripped my glasses off and there it was, glowing white around the edges, the eclipsed sun. A shimmering white ring illuminated the sky, surrounded by a deep, deep blue, heavier than any blue I had ever seen. The sun, the moon, whatever this thing was, stood in place and froze me in mine. I couldn’t speak, even as the others freaked out. I was transfixed, speechless, my mouth agape. After a minute I was able to look away and I took in the darkness around me, at the stars above, at the mountains in the distance, dark and ghostly, but came back to the moon/sun until it was time for the world to go back to normal. It was hands down the most amazing thing I had ever seen. It was like seeing God. I don’t remember what I said to my friends, or what they said to me, or each other, or the people next to us. I know Jonah was taking pictures. There were coyote howls (by humans) below, screaming, cursing, gasps all around. I know there were noises, but what they signified, I can’t say. Then the sky cracked back open, light spilling back onto things, and the world righted itself. We were shocked, laughing and gasping still. We stood in shock for awhile, exchanging photos and thoughts with our new kombucha-fermenting friends, who in my mind by virtue of sharing this experience with us had become bonded to us for eternity — I will no doubt run into them in heaven, or wherever you go after you die. We’re friends on Instagram now, at least. We stayed another few minutes before heading back down to our campsite. The color and warmth returned to the world. Suddenly it was like nothing had happened. An entire dusk and night and dawn and day had passed in the space of a few minutes. And we were there to witness it. I’d begun planning this trip back in January, but for all the hours of tracing my fingers across maps, of looking up campsites, of researching what the hell “dispersed camping” meant anyway, of booking flights, of assembling shopping lists, of driving, of huddling in the cold, of waking up in frost, of preparing mentally and physically for the trip, it never occurred to me that everything would go so smoothly, and that I would so easily see one of the marvels of the natural world, over one of the country’s greatest natural treasures. Meanwhile, across the road, Grand Teton National Park was indeed experiencing its busiest day ever, with 40 percent more visitors that day than the same date the year prior. We packed up our stuff leisurely and, perhaps an hour after the eclipse, began our drive up into Yellowstone for the next part of our adventure. We drove out of the forest, then up to the Moran entrance of Grand Teton, which connects to Yellowstone. There was almost no line. The park ranger at the window told us admission was free that day. He was like slightly more cognizant Tommy Chong — gray beard, sunglasses, an easy and perhaps stoned manner about him. “You guys look like you’ve been having fun,” noticing some red eyeballs — it had been dusty up on that bluff. We laughed and pulled off. We stopped briefly to take some photos of Tetons from up close, then headed to Yellowstone. Near the southern entrance, a line of cars appeared. It was the first real traffic we’d encountered the entire trip. It lasted about 15 minutes, maybe 20, and then we were on our way. We ended up spending as much time trying to get into the parking lot to see the Grand Prismatic Spring that day than we did at any other point in the trip. So the next time there’s a once-in-a-lifetime opportunity to, let’s say, see a solar eclipse, but you’re worried about the crowds, do yourself a favor: Plan ahead, look for nearby national forests where you can avoid the crowds of people who insist on being on the other side of the road because it’s technically in the Park Itself, and go for it. It’ll probably be fine.